No matter how good any collection of items may be, there has to be one among them that's the worst; if you had a stack of gold bars, there would be one gold bar that - better than lead though it may be - was the least shiny. A legendary warrior, Sif fights alongside Thor in the Maurauders' war at the battle of Vanaheim to regain control of the nine realms. To end the siege, Thor strikes down the giant rock monster. Together, Sif and Thor take the Marauders prisoner and bring them to Asgaard to face justice. Side by side with his childhood friend, Sif, thor strikes down the Maurauders on Vanaheim, seeking to bring peace back to the Nine Realms. Well that's repetitive, isn't it? Eh, it's only fair, this figure is equally repetitive. 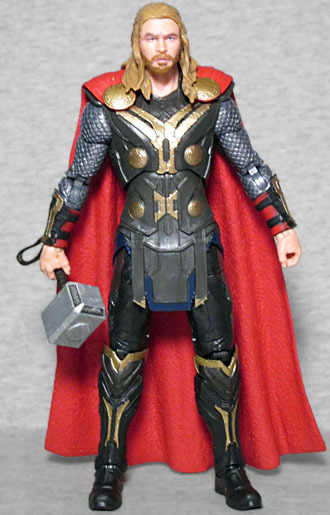 Part of the reason I was down with getting Bruce Banner by himself is that this Thor is, with only one small exception, the same Thor that was in that Avengers Something You Know Whatever Amazon four-pack. So if I did buy the whole thing, I'd pretty much be double-dipping again. Again again. Costume-wise, the difference between Thor 2 and Avengers 2 is that Dark World Thor wears armor on his arms, while Age of Ultron Thor went bare. "Sun's out, guns out," I guess. [it is called "The Dark World," after all --ed.] 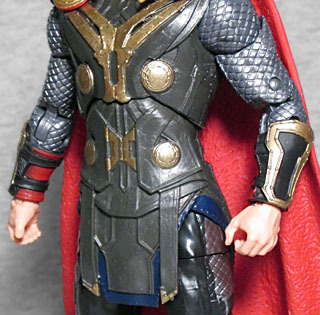 It's a little disappointing, since that four-pack is the only time there's been a 6" Thor without sleeves, but the rest of the body is different enough from the existing figure that it doesn't feel like a rehash. The lines of the suit are completely different, and the colors are darker: grey and gold instead of blue and silver. His cape has a texture on the interior, but not the exterior. The flares on his boots are molded as part of the lower leg, so they stick out realistically when youy bend the knees. The head is the same sculpt as the 2015 figure, but the paint is far better this time, thanks to Hasbro's "Photo Real" painting process. Dig that angry Hemsworthiness! The hair is also done with a slightly darker, slightly more realistic shade - especially the beard, which is not the same color as the rest of his face this time. Improvement! 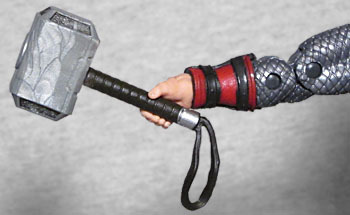 Thor includes Mjolnir, as you'd expect, but what's really neat is that the hinges in his wrist run side-to-side, rather than front-to-back, meaning that he can point it, as if to summon or redirect some lightning. Good thinking, team! A long-time ally of Thor and a powerful Asgaardian warrior, Sif battles with a double-bladed sword and a keen understanding of her enemies. 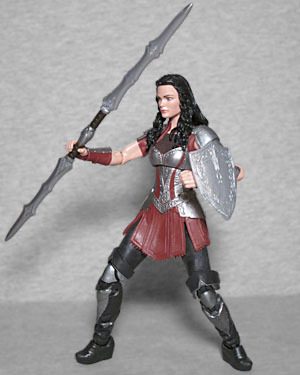 Thanks to Jaimie Alexander's commitment to her TV series, Blindspot, Sif was unable to appear in Thor Ragnarok - which may work out for the best for the character, considering the way Hela ripped through the Warriors Three. And also considering that Disney is planning a Sif miniseries for their upcoming "we don't like the fact that Netflix is making money that we could be making instead" streaming service (because being, like, the 40th company to rush into an already-saturated marketplace is always a recipe for success - that's why everybody has completely forgotten the names PUBG and Fortnite and is instead spending all their time playing The Culling II and Radical Heights). 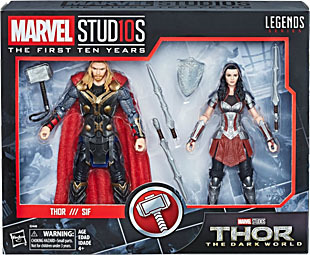 Anyway, this set is based on Thor 2, not Thor 3, so Sif is totally fair game for inclusion. 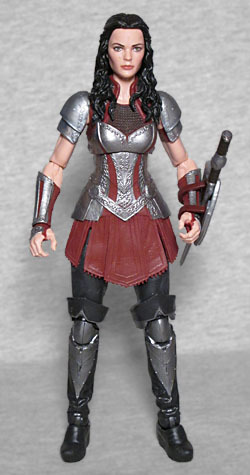 There was a Sif figure from the first Thor movie, but it was A) super rare, and B) ugly as sin. This one handily fixes both those issues. The Jaimie Alexander likeness is superb, thanks to both the uncredited sculptor's work and the Photo Real printing. If she didn't have to compete with Hope van Dyne, this might be the greatest female likeness of the year. 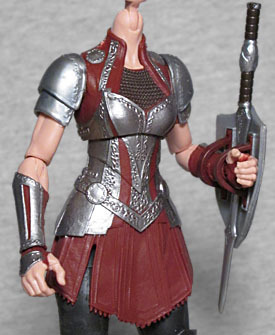 Her outfit has a very "Lord of the Rings" feel, with light armor on the shins, knees, forearms, shoulders, and bodice, and a little bit of chainmail worn under her shirt red dress. Wait, under? She wears chainmail under her clothes? That can't be comfortable. At least she's got some black pants under the skirt. Her boots have the same kind of flares on the knees that Thor had, but her soles are apparently wedges, because why wouldn't a warrior goddess be self-conscious about her height? Better than the thick heels from Movie 1. The feet also appear slightly too small for the body, but that may be an illusion based on scale. The detailing on her armor is surprisingly intricate - in fact, it might be even more detailed than the real costume seen in the film! The articulation is as good as it always is - that sort of reliability is part of the reason Marvel Legends was named the best toyline of 2018. Her hair would normally get in the way of the neck movement, but it's such a soft and flexible PVC that it'll push out of the way pretty well. Her accessories include a small shield, and two versions of her sword: one single-bladed, and one double. In the movie, she stows the sword (in its shorter form) between her shield and her arm, but you can't do that here. Unless you try. Seriously, the sword slides in there with no trouble at all, almost as if they had purposely designed it that way. Neat! Thor: The Dark World may be the dingiest gold bar in the Marvel Studios pile, but that's praising with faint damns, and while this Thor may be almost identical to one released before, we haven't had a Sif like this and she's awesome.